The story of how cookies became salads. Living with someone who has dietary restrictions has made me more grateful for being able to eat almost anything, and also introduced me to new, healthier foods. Our fridge was always stocked with fruit, veggies, and an assortment of yogurts that consistently inspired me to put away the cookies and redirect my cravings toward something lighter. After a couple of weeks, I learned that foods like Cheerios and Luna Bars are a godsend for people living with the celiac disease. I became addicted to trail mix and experienced some pretty serious dried mango cravings. As I became more conscious of the foods that I brought into our room, I realized that my diet was changing. I had started eating way healthier just by living with my gluten-free roommate. Suddenly, a meal of chicken fingers or grilled cheese at the diner at 2 am turned into grabbing a salad together at the dining hall. Thanks to my roommate, insanely dressed-up salads became a daily norm for lunch and dinner. Seriously, she makes killer salads, and I owe her a ton for this because otherwise I would have just shoved noodles in my face and called it a day. I started to jam-pack my lunches with a multitude of veggies and fruits that tasted amazing and made my body feel better. While I did spend a whole semester living with my incredibly strong-willed roommate, I still don’t know how she does it. Giving up homemade cookies from Mom is not something I see in my future, but I do think that my diet is more balanced and my body is very thankful for her influence. 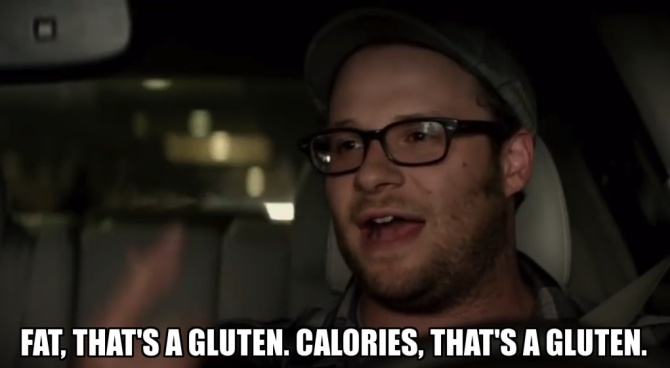 Shout out to all the GF foodies out there, because who are we trying to kid? That sh*t is hard.